Tonight we're making our version of Chicken Cacciatore. While this meal will taste as guilty as they come, this sauce is packed with veggies, lean chicken breast and served over whole grain pasta so you can feel good about eating this pasta dish! 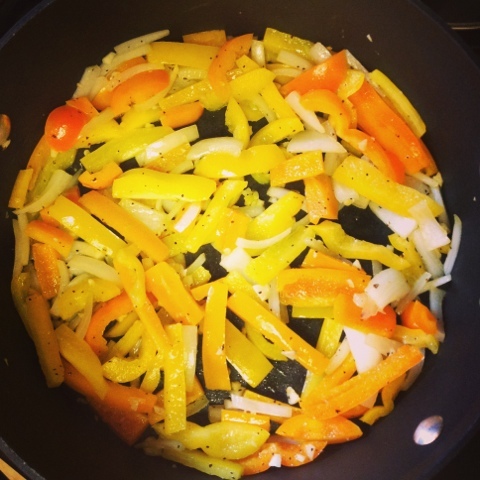 We start by sautéing up bell peppers, onions and garlic and layer in crushed tomatoes & oregano for added flavor. 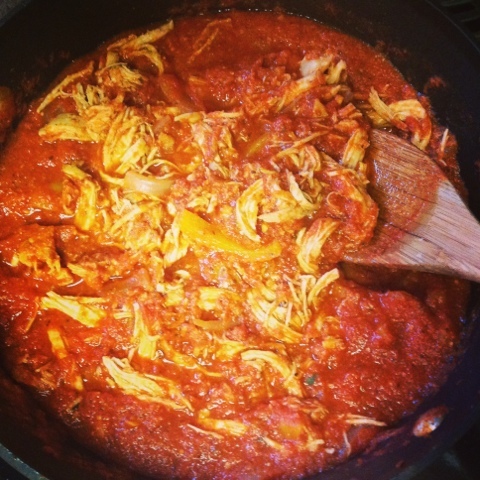 We add boiled shredded chicken (boiled means NO added calories when cooking it!) and let it simmer away for a thick, delicious texture. We dish this out over one serving of whole grain pasta and top with a sprinkle of Parmesan cheese! 1. Slice bell peppers, onion and mince garlic. 2. Heat deep sauté pan over medium high heat and add olive oil, peppers, onion & garlic. 3. In the meantime, boil chicken breast until cooked through and shred once cooled. 4. Add crushed tomatoes, oregano and chicken to pan with veggies and let simmer for at least 30 minutes. The longer it cooks the better it will taste :). Season with a pinch of salt & pepper. 5. Cook pasta according to package directions and dish out into 4 servings. 6. Top each bowl with chicken cacciatore & 1/4 of the Parmesan cheese to finish.